This IBM® Redbooks® publication will help you install, tailor, and configure IBM ProtecTIER® products with IBM Tivoli® Storage Manager to harness the performance and the power of the two products working together as a data protection solution. This book goes beyond the preferred practices of each product and provides in-depth explanations of each of the items that are configurable, and the underlying reasons behind the suggestions. This book provides enough detailed information to allow an administrator to make the correct choices about which methods to use when implementing both products to meet and to exceed the business requirements. This book is intended for storage administrators and architects who have ordered and installed IBM ProtecTIER Products and want to implement Tivoli Storage Manager as part of a data protection solution. 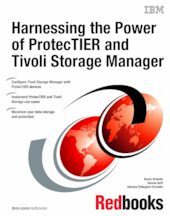 This book is also intended for anyone that wants to learn more about applying and using the benefits of ProtecTIER running with Tivoli Storage Manager.